Secure DNS Managed On-prem and in the Cloud. Your organization depends on your network. And your network depends on core services like DDI, load balancing and DNS protection to run reliably and securely. Infoblox brings next-level security, reliability and automation to cloud and hybrid systems, managed through a single pane of glass. Billions of threat indicators that can be operationalized and 30+ API level integrations with security vendors. Tier 1 foundation with five nines availability delivered as software-defined services. Cutting manual tasks by 70 percent and annual costs by one million dollars or more. As organizations move to the cloud, it’s more critical than ever to efficiently manage and secure your network. 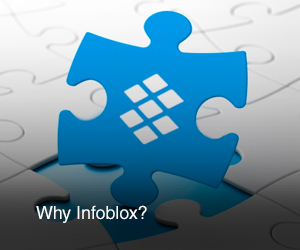 Infoblox empowers businesses to run safer and faster with centralized management across physical, virtual, cloud and hybrid environments. Get a unified view of every device, IP, endpoint, and virtual machine on your network. Transform raw network data into actionable intelligence and apply insights to speed performance and application response. Automate routine tasks with real-time insights to achieve compliance and deploy new apps and services faster. DNS is the #1 pathway for malware and data theft. Protect from the broadest range of DNS-based threats with billions of threat indicators. Prioritize security response by combining network data insights with curated, updated threat intelligence presented in context. Tight integration with 40+ APIs for and third-party security, virtualization, and cloud ecosystems integration. READY TO GO NEXT LEVEL? Elevate security, reliability, and automation across on-premises, and private, hybrid, and public cloud environments.